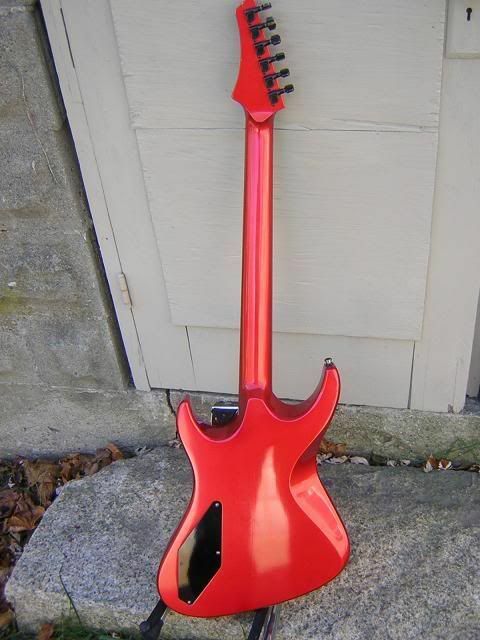 I bought this AT-4 sometime back in the 90's, from Performance Music in Woburn MA. They said they were an authorized dealer back in the day. I was told by them that the body and neck were mahogany; does that make sense? It's pretty light, very resonant. Also note the hang tag in the last pic; that looks like Paul's signature, no? Last edited by RickC on Tue Sep 04, 2007 9:58 am, edited 1 time in total. 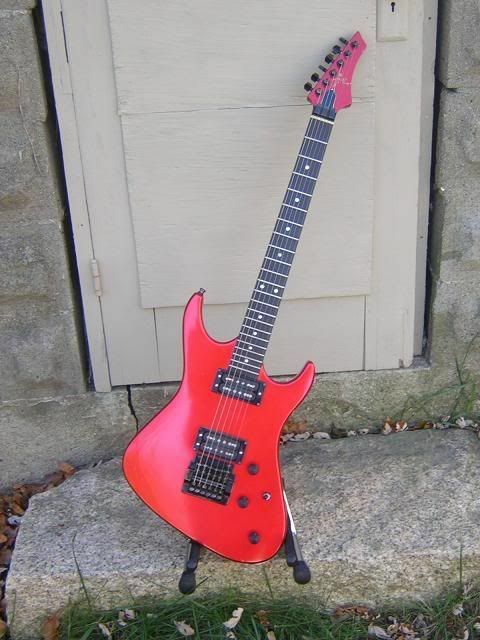 RickC wrote: I bought this AT-4 sometime back in the 90's, from Performance Music in Woburn MA. They said they were an authorized dealer back in the day. I was told by them that the body and neck were mahogany; does that make sense? It's pretty light, very resonant. Glad you posted. All Times have Maple necks. Looking at the back picture...f you hold it up to the light and see very fine grain lines it's likely a Mahogany body. 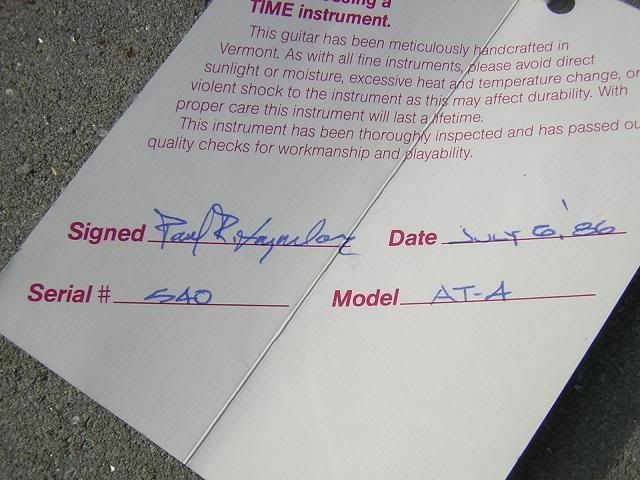 The Kahler & serial number 540 put it near the middle of production for the 'thru the back' controls guitars. 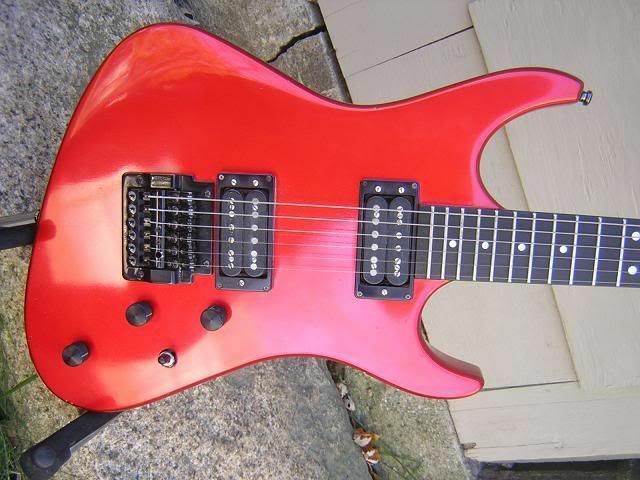 Almost all the last guitars had Alder bodies, Floyd Roses and either one or three pickups. i.e What is now called the Super-Strat. And yes, that is Paul's signature. A note to all: Recently this board has been inundated with spammers trying to join. Rick, your email address and username looked legit. I automatically delete any user request that looks weird! Thanks Chris, good to know. I do see the grain lines through the finish. Also, can anyone tell me what the controls are *supposed* to do? Mine behave in a non-intuitive manner. RickC wrote: Thanks Chris, good to know. I do see the grain lines through the finish. The front upper knob is a master volume. The back lower knob is a master tone. 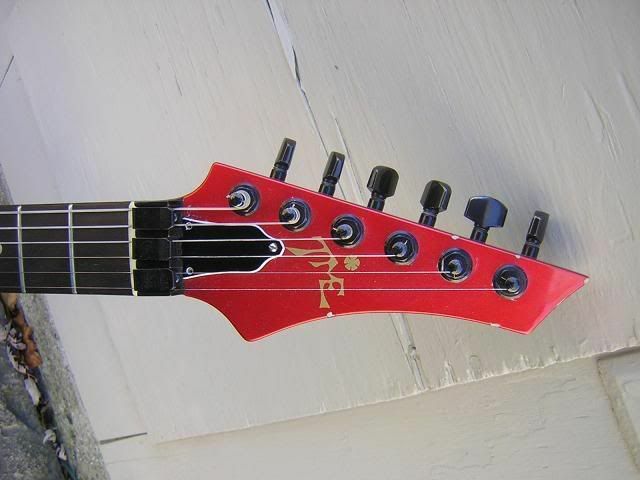 The back top knob is usually a bridge or neck volume. I don't remember which right now. Turn up both volumes. set the selector switch to both pickups, then roll off the back volume knob. Note which pickup quiets down. The selector switch is up for the neck, middle is both pickups, and down is the bridge pickup only.